2D instrument panel native support for 1280-, 1600-, and 1920-pixel-wide video modes. 279 unique sound effects and voice callouts; callouts performed by actress Sally Beaumont (included with XRSound). Altea Aerospace SCRAM engines operable up to ~mach 17 (XR1) or ~mach 20 (XR2/XR5). Extensive refueling/resupply support via the lower instrument panel. Reworked TSFC ("Thrust-Specific Fuel Consumption") screen showing main engine and hover engine efficiency (affected by atmospheric pressure). Dynamic Pressure and Static Pressure gauges; useful for optimizing your ascent when using the SCRAM engines. Slope gauge showing ascent/descent slope. SCRAM Diffuser Temperature gauge which allows the pilot to monitor when the SCRAM engines reach the edge of their performance envelope. Two configurable pop-up HUDs. The secondary HUD has five modes and is fully configurable for data, color, and transparency. The tertiary HUD shows status and warning messages and is configurable for color and transparency only. A new configuration file in your C:\Orbiter\config directory for each vessel named DeltaGliderXR1Prefs.cfg, XR5VanguardPrefs.cfg, or XR2RavenstarPrefs.cfg for the XR1, XR5, and XR2, respectively. This file allows you to configure many ship settings, including flight settings, disabling/enabling a given damage type, pop-up HUD colors and fields, etc. Read the detailed comments in each file for details. 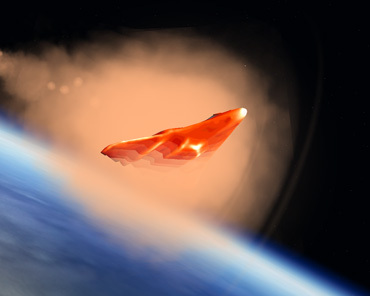 Full reentry heating and damage support. Realistic fuzzy logic hull overheating support. Master Warning System with an alarm tone and a warning light panel. Full support for audio warnings is also implemented. [CHEATCODES] support in the configuration file that allows you to directly set certain ship values such as the ship's mass, max engine thrust, fuel tank capacity, etc. Full damage and crash simulation, including gear collapse based on touchdown vertical speed and ship mass. Auxiliary Power Unit (APU) that powers the ship’s hydraulic systems; the APU must be running in order for hydraulic systems to operate. Many other features detailed in the XR Flight Operations Manual. A fully active virtual cockpit (VC); you can switch between cockpit modes by pressing F8. Full payload support that supports any payload module (i.e., vessel) that exists in Orbiter that can fit in the payload bay. The Vanguard can carry up to 432 metric tons of payload, whereas the XR2’s recommended payload limit is 10.8 metric tons. A payload instrument panel to manage grappling/deploying payload. Support for auxiliary fuel and LOX tank payload modules attached in the payload bay. Bay tanks drain first in flight and fill last when ship is resupplied. Automatically adds default sounds for all Orbiter vessels -- not just XR vessels! Each sound is fully configurable via XRSound.cfg, optional Orbiter vessel class-specific config files, or the XRSound C++ SDK (included). Includes over 450 default sound files, including all XR vessel voice callouts by actress Sally Beaumont and 141 ATC callouts from STS-114 and STS-121 featuring CAPCOM Julie Payette. For more information, check out the XRSound User Manual. Powered by irrKlang Pro Sound Engine. A static virtual cockpit (VC); you can switch between cockpit modes by pressing F8. Hull heating visual effects (screenshot above). Independent front/rear gear compression animation on takeoffs and landings. A crew elevator to allow the crew to EVA while landed. Crew can EVA/ingress via either the top-mounted docking port or the crew elevator. A top-mounted docking port that includes a docking camera panel view. An RCS Config mode that switches between standard and docking RCS configurations: in RCS docking configuration, two things happen: 1) power to the RCS jets is reduced to 40% of normal to allow for precise control of the ship while docking, and 2) the control axes for the RCS jets are switched so that when you are looking along the docking port centerline camera you can use the RCS Rotation and Translation keys just as though you were looking along the nose with a nosecone docking port; i.e., it will feel "normal." For example, pressing NUMPAD-6 in translation mode will move the ship forward along the Z axis in normal RCS mode, but it will move the ship up along the Y axis in docking RCS mode.